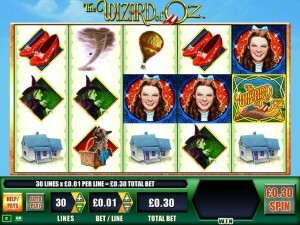 The Wizard of Oz is a WMS slot machine which is themed around the 1939 movie with the same name. Since that’s the case, you can expect to find on its reels images of actors that played in it, plus a number of symbols which show you objects that were in the movie, though in this case they are computer made and you can guess that they’re drawings rather than photos of the real thing. It’s one of the three slots that WMS designed with the same topic, though each one offers a different experience ultimately. The slot’s 5 reels are occupied by a maximum of 30 bet lines. 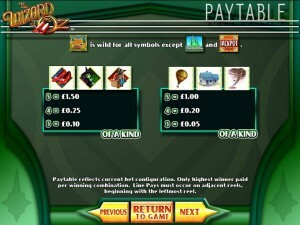 There are multiple features to be triggered, with wilds, scatter symbols, bonus games and free spins being in place. There is also a prize that goes up to $50,000. 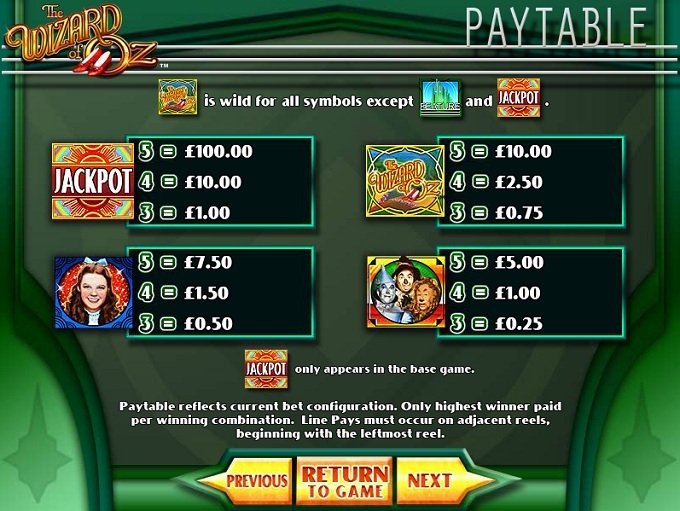 Luckily, there are plenty of features to take advantage of in the game, starting with the wilds, the scatter symbols, bonus games and free spins. The slot’s logo is the one to watch out for when you’re in search for the wild symbol. It’s going to be useful in a couple of ways, mainly as a substitute since it’s easier for it to appear on its own, but from time to time it will form combinations directly as well. It can pay up to 1,000 coins for a combo of five icons, but surprisingly enough it’s not the one to give the best prize available. 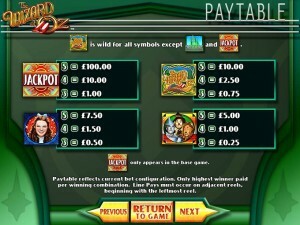 The wild capability of this symbol doesn’t extend to the scatter or the Jackpot. The scatter symbol is going to have the Feature logo on it and it will get you an interesting feature called the Oz Pick if at least three such icons are in place. The choice will let you pick a bonus game, free spins or cash prizes. This option is the one that gets you free spins. 8 rounds of these free games are available inside. From time to time, you will see a Winged Monkey make an appearance, and when that happens you get multiple random wilds replacing regular symbols. This is the other option which triggers a feature, and it’s bringing you a bonus game. Here, you have to choose emeralds, and they will get you prizes and attempts at getting other characters to come with you on the trip to Emerald City. The four places you can visit include Wicked Witch Castle, the Lion’s Dark Forest, Tin Man’s Orchard and Scarecrow Corn Field. If the character doesn’t join you on your trip, you get a cash prize as consolation. You continue to pick emeralds up to the point where you arrive at Emerald City. Once at the destination, you get a wheel of chance feature where you win a prize for each character. 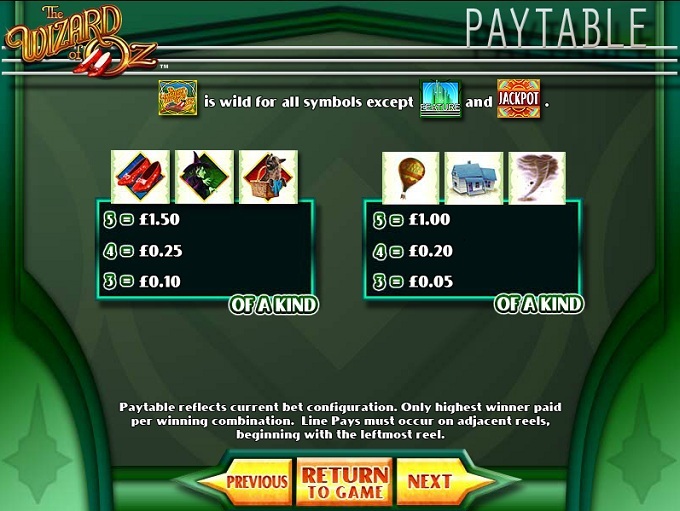 You may use 30 coins on each round of the game, which will be sufficient to trigger the same number of lines. Each coin has a value that you choose, but within the given range, of $0.01 to $5. The largest wager allowed per spin is at $150. If you get the big prize, you will have 10,000 coins in your account, with a value of up to $50,000. Though slightly looking like cartoons, you can still recognize the images of the actors from The Wizard of Oz film as being closer to photos of them. Most symbols are with things like tornadoes, houses, shoes and other objects. The slot does a decent job at offering a design inspired by the 1939 film with the same name. Symbols: Game Logo (wild, 1,000 coins), Feature Logo (scatter), Jackpot (10,000 coins), Dorothy (750 coins), Companions (500 coins), Ruby Slippers (150 coins), Witch (150 coins), Dog in basket (150 coins), Balloon (100 coins), House (100 coins) and Tornado (100 coins). It’s a great game if the movie or the novel are favorites of yours. It has all the right features as well, big prizes and at least decent graphics. Released in 1939, The Wizard of Oz was an adaptation of a novel from the year 1900, written by L. Frank Baum. The name was originally “The Wonderful Wizard of Oz”. As for the movie, among its main actors you will find names like Judy Garland, Jack Harley, Ray Bolger, Billie Burke, Frank Morgan and others. It’s a highly popular movie of the time, using Technicolor technology and winning two Academy Awards, out of the six nominations. It wasn’t hugely popular among movie goers of the time, despite the high budget. 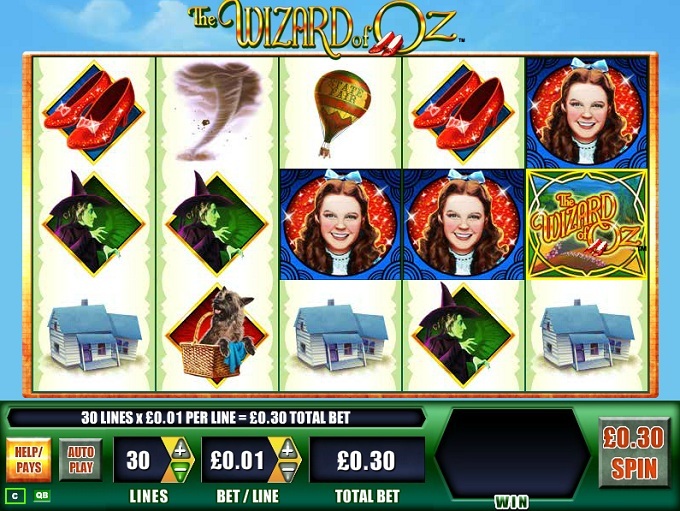 You will find The Wizard of Oz at any online casino which chooses to use software from WMS, playable either for free or for real money.